The hotel itself is currently undergoing a complete redesign and the rooms and restaurant are looking amazing, definitely a hotel to visit. 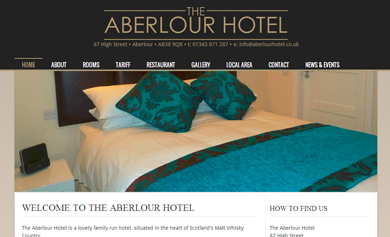 "The Aberlour Hotel is a lovely family run hotel, situated in the heart of Scotland's Malt Whisky Country. A lot of the areas of the website are still under construction, but all areas should be completed over the next few weeks so keep checking back, If you have any enquiries please do not hesitate to get in touch."